TMJ dysfunction is a common cause of orofacial pain. It can often be treated conservatively, but sometimes requires surgery. Left – the temporomandibular joint (TMJ) connects the mandible (lower jaw) to the temporal bone (of the skull) at each side of the head just in front of the ear. Right – if you place index fingers in front of each ear and open and close your mouth, you can feel the joints move. 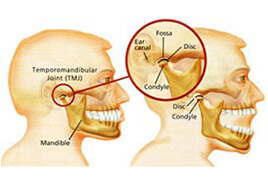 The temporomandibular joint (TMJ) connects the mandible (lower jaw) to the temporal bone (of the skull) at each side of the head just in front of the ear. Because these joints are flexible, the jaw can move smoothly up and down, side to side, forwards and backwards, thus enabling us to talk, chew and yawn. Muscles attached to and surrounding the TMJ control its position and movement. The hard and soft tissue components of the TMJ are somewhat unique in that when one moves then so does the other. When the mouth is opened the rounded ends (condyles) of the lower jaw hinge and glide along the joint “sockets” of the temporal bone, returning to their original position when the mouth is closed. To keep this motion smooth, a soft “cartilage” disc lies in between the condyle and the temporal bone, and its main function is to absorb shocks to the TMJ from chewing, other movements and trauma. Internal derangement– any problem which does not allow the TMJ to function smoothly, but more specifically a problem with the position or structure of the disc. Myofascial pain – a common form of TMJ disorder that causes pain or discomfort in the muscles that control jaw function. Degenerative joint disease– conditions such as osteoarthritis or rheumatoid arthritis. The most common cause of temporomandibular joint disorders is trauma – either acute or chronic. It is well known that a severe acute injury to the jaw or TMJ may lead to a TMJ disorder – a heavy blow for example, may fracture bones within the joint or damage the disc thus disrupting the smooth motion of the jaw, causing pain and other symptoms. Symptoms may occur at the time of the injury and then resolve only to surface again at some time later. Degenerative joint disease may result from the injury. The most common form of chronic trauma to the TMJ is believed to result from clenching the teeth. Stress, either physical or emotional, may cause a person to clench or grind their teeth at night during sleep – this habit may also occur during the day. The action of clenching tires the jaw muscles, puts undue load on the disc and ligament of the TMJ and may result in displacement of the disc and subsequent disabling symptoms. Other causes of TMJ disorders are less clear. It has been suggested that a malocclusion (“bad bite”) may trigger the disorder, and orthodontic treatment which causes a movement of the teeth has also been blamed. Both these hypotheses are unlikely and have not been proven to be true. a clicking, popping or cracking sound in the joint. pain in and around the joint and associated jaw muscles. jaw locking – either open or closed. a disturbance in the “bite”. earaches and ringing or buzzing sounds. Symptoms are often worsened when eating tough foods, yawning, in cold weather and in the morning on awakening. For most patients the condition will usually progress from a painless click in the joint, through joint pain to joint locking, although the time frame will vary enormously from patient to patient. Exact causes and symptoms of TMJ disorders may at times be unclear, diagnosis may be difficult and confusing. In the vast majority of cases, however, your description of symptoms, combined with a simple but comprehensive physical examination of the face, neck, jaws and mouth, will provide enough information to make a diagnosis. The examination includes palpation of the TMJs and associated muscles in order to detect tenderness, listening for abnormal joint sounds, an analysis of jaw movement, and assessment of the teeth and bite. A careful check is also made of your medical and dental history. An X-ray of the jaw, and particularly the TMJs, is usually requested to assess the status of the bony components of the joint. Other more complex X-ray techniques, such as arthrography (injection of a dye into the joint), computerised tomography (CT) or magnetic resonance imaging (MRI) may be requested if a more detailed examination of the joint is required, and particularly if the soft tissue components are to be visualised. It is most important to remember that most TMJ disorders will respond to simple conservative (non-invasive) treatment if a patient presents in the early phases of the condition. Conservative treatment is always used initially, and for a minimum of three months – after this period the majority of patients will respond fully or to a level where symptoms are manageable and tolerable. resting the jaw – avoiding tough foods and extreme jaw movements (such as yawning, loud singing and gum chewing). learning special techniques for relaxing, identifying and reducing stress. applying heat to the jaw joints (TMJ’s) by means of a hot water bottle or commercial heat packs twice daily for ten minutes each time, morning and night. physiotherapy in the form of ultrasound. pain relieving and anti-inflammatory drugs. Perhaps the most important conservative measure is the construction of an occlusal (bite) splint. The splint is removable and is made of clear plastic and fits over the upper (usually) or lower teeth. The splint can help reduce the effects of clenching and grinding by keeping the teeth apart by a very small amount – the splint is about 2mm thick – and hence decreases the overload placed on the TMJ. Once the disc is “unloaded” it may regenerate to its normal position and function within the joint. The splint is usually worn only during sleep and does not cause permanent changes or damage to the bite or teeth. Your progress is checked regularly during conservative treatment to assess responses and to enable a prognosis to be presented to you. It is important to remember that conservative treatment may not “cure” TMJ dysfunction permanently and symptoms may recur, particularly if clenching continues. If this occurs, further assessment is essential. an injection of a cortisone into the joint. an arthroscopic examination of the joint. an open surgical operation on the joint. Surgical treatments may be irreversible and should be considered carefully by both patient and doctor. When such treatment is advised, your oral surgeon will carefully explain the possible alternatives, the side effects, possible complications and expected outcomes in words that you, the patient, can understand. Even when TMJ disorders have become chronic, most patients will not require or request more invasive methods of treatment and indeed the ultimate decision as to whether surgery is to be carried out rests with you, the patient, based on the advice given by your oral surgeon.